Happy Friday the 13th! Time for another installment of "This Day in Anthro History"...perhaps not completely holiday-appropriate, but at least it involves a cat...! 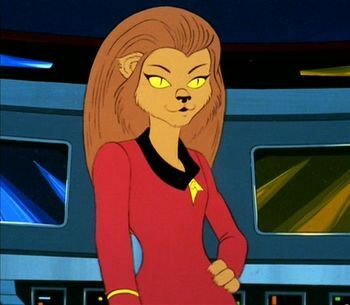 On October 13, 1973, the Star Trek: The Animated Series episode "The Survivor" aired for the first time, introducing the world to Lieutenant M'ress and the cat-like alien species known as Caitians. After all, every self-respecting SF or fantasy universe needs at least one group of cat people, am I right? Caitians would later be documented in live action Trek (like the admiral below who appeared in The Voyage Home) and, somewhat unfortunately, seem to have been ported into the new movies' timeline as catgirls with a more human appearance. Thanks for stopping by! Now, everybody head on over to Halls of the Nephilim and check out what +Justin Isaac has cooked up for release on this Friday the 13th...!